Intelligence is the foundation of our business. With steadfastness and precision, we have been referencing over 9,000 innovative products a year for more than 20 years, and incorporating them into our XTCscan™ database according to a set of strict criteria. XTC’s innovation intelligence activities are conducted in and include all possible channels: manufacturers, the trade press,websites, distribution channels and the major international trade shows. This invaluable intelligence data is gathered around the world by our network of innovation analysts. - In option: receive your personal alerts thanks to the service XTC alert me! Every XTCscan™ database user who subscribes to one of these two packages is also entitled to ongoing assistance from an XTC consultant and will receive the XTC Weekly Alert™ newsletter, which details the week’s top five innovations as uncovered around the globe by XTC. Each year, the World Innovation Panorama™ analyzes the major trends in food innovation worldwide. By using the segmentation XTC trends tree, this study is based on observations and analyzes of innovative products, claims and drivers used by the world’s manufacturers. The World Innovation Panorama is the benchmark study to have a full understanding of outstanding innovative products in food industry. Option presentation: please contact us. 22% of food innovations launched in Europe this year are private labels. Beyond this figure, the most impressive factor is the diversity and the pertinence of this innovation. Faced with this phenomenon, it is essential that you fully understand the nature of these evolving own brand innovations. Every year, the XTCscope™ of the Private Label Innovation analyzes movements in trends and product innovations of private labels in Europe and North America. Thanks to this annual study, XTC can meet the information needs of its manufacturer and distributor clients, given this constant evolving phenomenon. The XTCscope™ of the Private Label Innovation – which covers all food product segments and brands – analyzes private label innovations and their benefits, to reveal the strategic development potential behind each one. The XTCscope™ of the Private Label Innovation is available in English or in French in PDF file (+ option for hard copy and presentation). In 2010, one in five innovations in Europe is a private label! It punctuates our days, and because of its strong symbolic identity—after all, you are what you eat—food constitutes an effective window through which to observe consumption phenomena. Applying our parallel analysis of sociocultural changes and the latest food innovations, FUTURE FOOD .4 deciphers the trend data and the market’s expectations about products, services and communication. 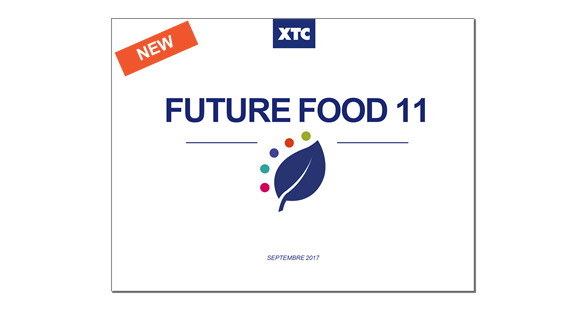 A joint production by all XTC World Innovation offices worldwide, the XTC FUTURE FOOD .4 project is managed by our expert. "Food Innovation Lab: innovative and relevant concepts"
Food Innovation Lab is a XTC department dedicated to creative workshop animation and concept generation in food industry. Its role is to stimulate creativity to get innovative and relevant concepts. Looking for products that meet specific criteria? Looking for products to feed your brainstorming sessions? Need to know more about a specific supermarket aisle located far from your home base? XTC’s global correspondents can handle all your product-, document- and photo-gathering requests, not to mention store-aisle analyses. Hosted by an XTC consultant, our half- or full-day Innovation Seminars can be presented at your offices or any other meeting facilities. Each Innovation Seminar provides an up-close-and-personal encounter between XTC specialists and your Marketing and R&D teams, and offers countless benefits, including opportunities to foster a culture of innovation within your company, the latest on all innovations and key trends affecting your markets and categories, as well as those that are related, and valuable knowledge about how to easily uncover potential leads for new product development. The resulting reports let you explore these trade shows as if you were there and to discover the world’s greatest food innovations as they happen. On request, XTC can also visit other major trade shows, such as SIAL in Shanghai or Montreal, Spain’s Alimentaria, and so on. Just ask, we’ll be there. Our Foodex 2011 trade show report contains the complete files of the greatest food Asian innovations selected by our local teams. XTC is the Trends & Innovations partner of the SIAL since 1996. Updated daily according to strict criteria, the database can be used anytime to find out about the latest innovations being offered to consumers the world over. It allows users to conduct searches by cross-referenced criteria and keywords covering any and all areas of interest, be they R&D, marketing, packaging, design and so on.